The ASEAN-Korea Center donated 3 million won ($2,650) to the Embassy of Lao People’s Democratic Republic on Aug. 6 to aid flood recovery efforts from a dam collapse on July 23. 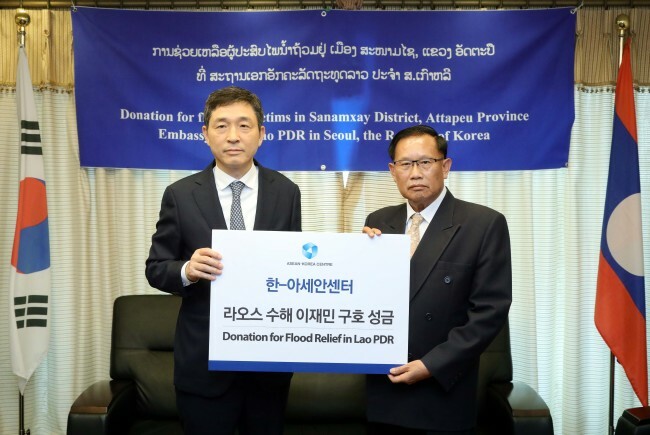 The center’s Secretary-General Lee Hyuk delivered the donation to Laos Ambassador to Korea Khamsouay Keodalavong, and expressed his sympathy and wish for a speedy rehabilitation of the disaster-stricken areas in the Southeast Asian country. “The Korean government and people are all united in helping Lao people in their strenuous efforts to make a quick recovery,” said Lee, a career diplomat who was Korea’s ambassador to Vietnam and the Philippines. Korea’s response to the disaster demonstrated that the nation considered Laos a “true friend and neighbor,” he added, wishing for a swift recovery. The hydroelectric dam in southeast Laos’ Champasak province was under construction when it collapsed under heavy torrential rains. It was being built by a joint investment venture involving SK Engineering and Construction, a building arm of South Korean conglomerate SK Group. The dam’s construction began in November 2013 and was to be completed by February 2019. The disaster has claimed the lives of at least 34 people, with 1,100 people still missing. It flooded several nearby villages, uprooting the lives of more than 7,000 residents and displacing them from their homes. The Korea Disaster Relief Team that was dispatched to Laos in early August consists of 15 medical personnel and seven other support staff. They will help treat displaced residents and prevent the spread of contagious diseases, according to Seoul’s Foreign Ministry. On Aug. 5, the Seoul government gave the Attapeu provincial government some 2,200 blankets, 4,500 towels and other materials as part of its $500,000 relief support. Meanwhile, SK E&C has sent nearly 200 rescue workers and executives alongside provisions of medical equipment and relief goods, including daily necessities, clothes and sanitation items worth 2 billion won. It also built temporary shelters for the 7,000 flood victims. SK Group Chairman Chey Tae-won delivered $10 million for the victims.